DUG Insight User ManualFrequently Asked QuestionsFrequently Asked Questions MiscellaneousHow to upload to our FTP server? If you are having problems converting SEG-Y data into dugio format, or if we require more information from you regarding your database, it might be better for you to send us your data so that we can get a better look at what is causing the error. If your data is too big to send via email, you can upload it to our FTP either by using an FTP client (i.e. FileZilla) or by using Internet Explorer. Follow the steps below for both methods. 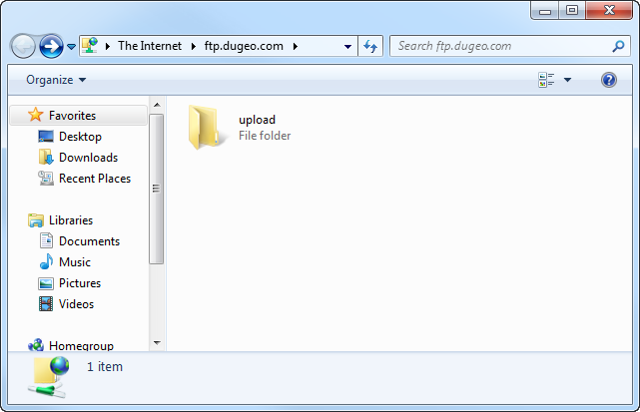 If you have an FTP client like FileZilla, transferring files is a simple three-step process. 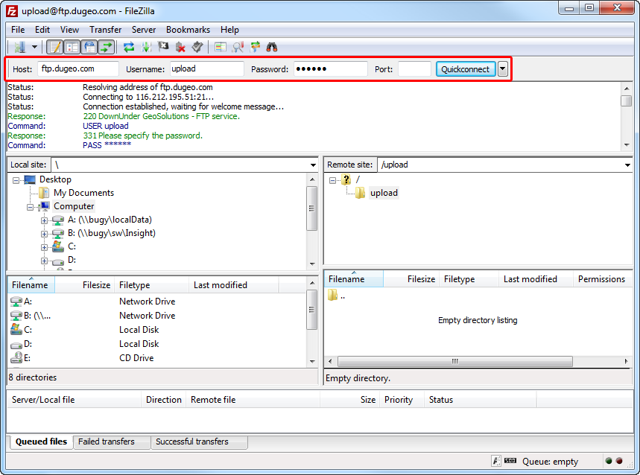 Open FileZilla from your desktop or Start menu. Type in the following at the top and click Quickconnect. Drag and drop the relevant files into the upload folder. Send us an email at support@dugeo.com to let us know that you have successfully uploaded the file(s) into the folder, and include the name of the file(s) in the email. Note: The folder will still appear empty after transferring the files into the folder. You can verify that the transfer was successful by looking at the Successful transfers tab at the bottom of the window. After the problem has been identified, we will revert back to you and send you the usable data. See How to download, unzip and load volumes and surveys into Insight? to download and load the files into your Insight project. Alternatively, you can also access our FTP using Internet Explorer. This method does not require you to have an FTP client installed. From your desktop or Start menu, open Internet Explorer. 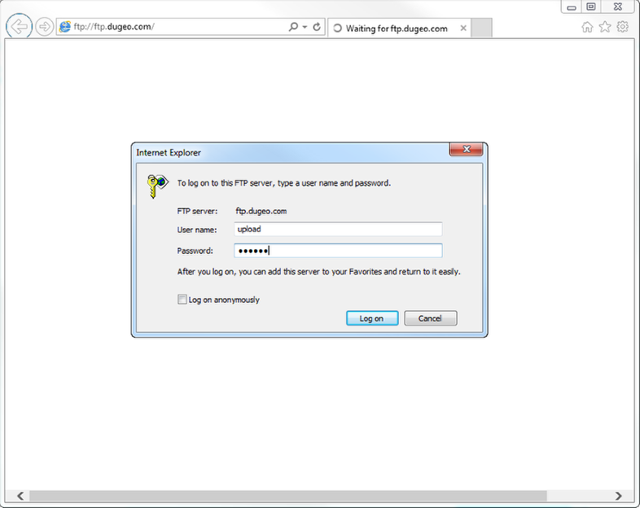 In the address bar, type ftp://ftp.dugeo.com and press Enter (or click on the link). Enter "upload" as the username and password, and click Log on. 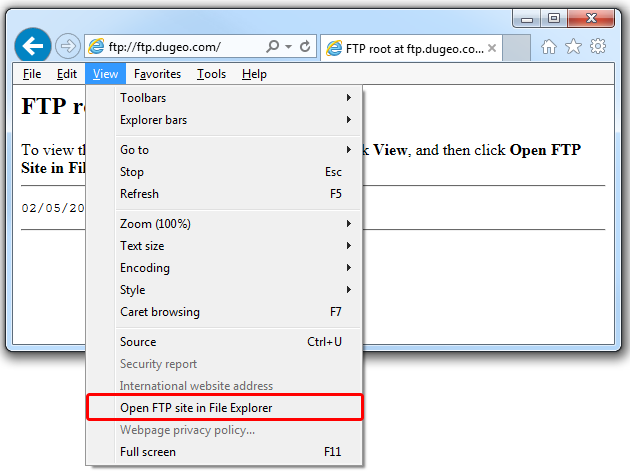 The FTP root page should appear with instructions to press Alt, click View and select Open FTP Site in File Explorer. The File Explorer window will appear and you are required to log in again. Type in the same username and password as before and click Log on. You can now drag and drop your files into the upload folder. Prev: How do I transfer depth-converted faults to Petrel? Next: How to download, unzip and load volumes and surveys into Insight?